General Motors, Ford and Chrysler all plan to add jobs in Michigan, which stands to benefit more than any other state. Nissan, BMW, Honda, Toyota, Kia and Mercedes-Benz also are hiring. Suppliers are looking to add engineers and technical people, but at a more gradual pace. About 15,000 auto-related Michigan jobs could be created this year, said Sean McAlinden, economist at Ann Arbor's Center for Automotive Research. That would double the jobs added from 2009 to 2011. 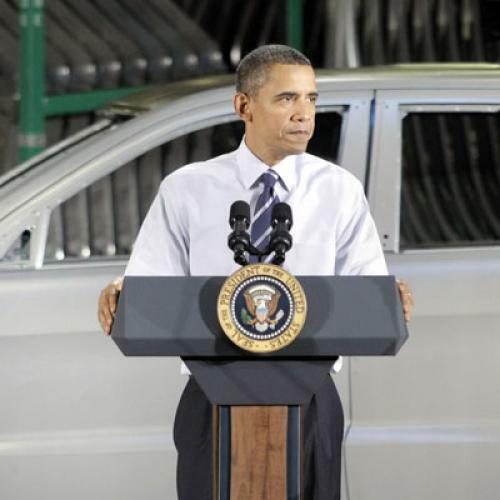 I noticed that Politfact criticized President Obama for boasting about the GM/Chrysler rescue during the State of the Union. That’s absurd. Everybody who follows the industry acknowledges that growth at GM and Chrysler reflects a variety of factors, including weakness from Japanese competitors following last year’s tsunami. But everybody who follows the industry also acknowledges that the entire domestic industry – not just GM and Chrysler, but possibly Ford and the massive, sprawling network of parts makers that supply the companies – could have collapsed if Obama hadn’t acted. Keep in mind that most Republicans, including the one most likely to become the party's presidential nominee, opposed using federal dollars to help the auto industry. Keep in mind that polls showed the public, already tired of bailouts and not all that fond of unions, was strongly against the move. In other words, it was not only the right thing to do: It was also the politically courageous thing to do. That gives Obama some bragging rights. This is not to say the auto industry is about to overtake Google as the leader of American industry. Ford makes terrific cars, as it has for some time, and General Motors is now doing the same. (Chrysler? I suspect that's more of a work in progress.) But neither Ford nor GM quite achieves the quality control or reliability of the best Japanese competitors, at least based on the data I’ve seen. And it’s not like the economy in Michigan is strong. Unemployment is still over 9 percent, lower than its been since before Obama took office but still very high. As the same Free Press article notes, the jobs coming back to the auto industry represent but a fraction of those the industry lost in the last decade. Thousands of engineers and line workers were laid off in recent years, but many took buyouts and moved out of Michigan. Other available workers often don't have the blend of industrial and mechanical engineering skills that companies seek. "We're definitely in need of some engineers and are having a difficult time finding the right people out there," said James Voeffray, vice president of sales and marketing for GKN Driveline, which has a research center in Auburn Hills. Economist Gary Burtless wrote about this very problem a few days ago, in response to the widely read New York Times article about Apple computer and its decision to base iPhone production in China. The American workforce may not be uneducated per se: There are plenty of college graduates looking for work, at least right now. But companies like Apple and the automakers don’t need people with four-year engineering degrees from major universities: They need people with two- and four-year technical degrees from community colleges. As it happens, the agenda Obama introduced during the State of the Union Tuesday night seeks to address this issue. It includes a plan to link up community colleges with local employers, in order to churn out more graduates who can actually find work. I’m still studying the plan, so I can’t really say yet whether it will help. But it’s interesting – and I wouldn’t be the least bit surprised if we hear more about it from Obama on Friday.